Martin's exhibition is not to be missed if you are in the Durham area. Martin's work is painstakingly made by overlapping exquisite digital prints over cardboard and chicken wire armatures. It may not sound beautiful, but it is both beautiful and otherworldly, hyper-real and superficial, disturbing and true, pre and post-apocalyptic. Martins says in her own statement at the show, "I struggle between the local and global played out in the mountainous landscape of western North Carolina...Constructions describe physical reality but also the relationship between that reality and the ideological understanding of how this area fits in the wider socioeconomic system." Or doesn't fit. Martin's constructs are not comfortable or luxurious. Her miniature worlds do not seem to be part of the global economy but rather, victims of it. Her maquettes appear to be abandoned lots or criminal scenes. For example, METH LAB is a precarious trailer made of digital prints attached in a semi-perspectival fashion. It is slumped upon a tall reclaimed and transformed antique sewing table, the legs elongated, a small round pile of red dirt upon the floor beneath it, a roof branch growing or decaying upside down under the table top. On top of the table is the detritus of a meth lab: bits of Spanish moss like tumbleweeds; tiny digital daffodils; grit and pebbles like boulders at this scale; real dirt and a digital bucket of dirt; cement; garbage; glass shards; fake acorns. The scale throws you as does the combination of different modes of representation - digital images and real things, chicken wire trees tied, taped and leafless, a photographic old stone chimney in the background. You imagine the people who once produced meth here are long gone, in jail or trouble, or dead. This is desolation. Martin shows us the underside of things, the back, the surprising lack of support and how surfaces appear attractive but offer little sustenance. Perhaps we have sucked all the sustenance out and are so thirsty that we are leaving our earth dry, barren, aching, broken, empty, not a soul in sight. In DROWNING CAR, a digital cutout and 3-D folded car pierces through the digitally simulated paper river, the nose of the car pulling the body down into the deep. The riverbanks are covered with tiny overlapping digital green leaves, hand-cut, delicate and obsessive. A few Dr. Suess stumpy trees rise from the banks, also covered in leaves. If you look closer, you notice the black and white tips of the stumpy green tree limbs - deforestation. This square slice of a scene sits atop a column of dead kudzu vines, leafless. Kudzu is a killer in North Carolina, gobbling up gorgeous trees and landscapes until there is nothing left but parched landscapes, nests of wild weeds. (But when it carpets huge areas in wild hanging green, it is the kind of striking beauty you pull over to the side of the road for, to take a picture.) The top of the car is actually a photographic image of rust or red clay earth - you can't tell - but what you can see is that there is no one here. You consider suicide, over-consumption, a murder, an accident, and a disaster. I hear Virilio loud and clear, "When you build a ship, you build the shipwreck." The most compelling and unforgettable piece in the show is UNDONE. 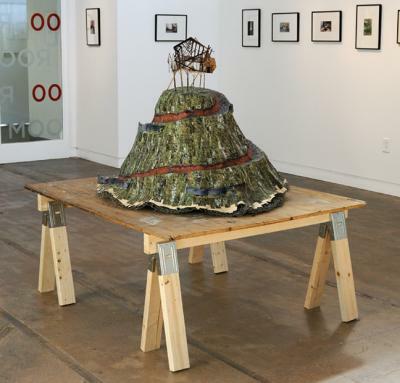 It sits in the middle of the room and is a majestic joke, a tower of flat Babel: two sawhorses hold a square of beat up wood like a makeshift table upon which hovers this spiraling mountain made out of digital prints that are layered and cover chicken wire. The chicken wire could be completely hidden, but Martin chooses to leave just an edge of it showing around the bottom of this strange hill. In a world of confounded speech with no people to even utter it, there can be no secrets. The imagery with which Martin wallpapers this structure is red clay, a stone road, and black plastic fences between weak poles along the edges of this green hill. The road and fences and red earth all circle up to the pinnacle - a diagrammatic armature facade of a house, an advertisement to our culture, or lack of. The thin paper house is white on the back with 2 thin wooden stilts propping it up. It sits on top of this volcano like a false promise. Martin conjures Thomas Hirschhorn and Gordon Matta-Clark, Roxy Paine and James Casabere. While her 3 sculptures are the strongest work in the exhibition, her photographs are quite powerful. Martin employs photography as evidence and analogy. Martin includes 5 photographs (18" x 24" archival digital prints) from her COMFORT AND CONSUMPTION series of old refrigerators piled high in a dump. She transforms these heavy and hazardous boxes into modernist, Nancy Rubins, anti-domestic and post-industrial configurations. The tumbling folded steel, rust, boxes of emptiness once full of sustenance, heaps of metal and shelves, crumpled and wrinkled like bodies, become abstract and heavenly landscapes - like Robert Ryman or Cy Twombly paintings. These are anti-monuments rising against the empty white sky. She includes 3 images from MAINSTREETS, an incredible sculpture that was exhibited for the last 3 months in Chapel Hill at the Local Histories: The Ground We Walk On. It is breathtaking to see the photographs of the sculpture. If you don't know about the sculpture - a small-town street that could be anywhere-USA but is actually an amalgamation of 5 North Carolina towns made up of cardboard boxes as the buildings that are covered with digital prints, the street made of wooden slats - you would think you were looking at a real town. Martin hand cuts hundreds of images of plastic chairs so she can throw them out in a heap upon the photographic sidewalk. Again, there is not a person to be found in this place, only For Rent signs, closed up shops, the story of so many fairytale towns in 2011. There are 9 photographs from the SECOND FLOOR MAINSTREETS series and these are "real" photographs of real things, chairs mostly. Forlorn and lost like bodies, these chairs are covered in dust, waiting to be sat in or tossed in a dump or dragged home by someone who needs a chair. But here, on Mainstreet USA, these chairs are invisible, forgotten and unused, and so beautiful. Martin turns 2 into a Mondrian composition - an orange and green vinyl chair-couple rest in an avocado green room, a white baseboard framing the scene. Another image is like a Gordon Matta-Clark installation - one yellow chair sits in the corner of the foreground room and in the back room, a jumble of chairs sit in front of a white stucco wall with 4 holes in it the size of basketballs. The back of one black chair first appears to be another of the black holes but it is not. The holes seem deliberate, composed, so right and deep and empty, like Matta-Clark's holes through floors and buildings. There are dirty sinks, dark hallways, peeled wallpaper, radiators, windowsills, bright quadrants of light from the windows - a perfect backdrop for these chairs watching nothing, waiting. While Martin's world is lonely and strange, it is also brilliant and seductive. Somehow she matches the strangeness of the real world with the uncanny power of her own constructions and makes us want to linger, consider and look again at how we are living. I am struck by the elegance of martin's work - so much dredge and drudge, dirt and emptiness, failure and waste reconstructed and re-represented with such attention to detail that we are forced to enter this otherworldly place, a movie set, a paradise gone wrong, the here and now.